Allergy is a catch-all word for a wide variety of reactions to substances that the body determines to be foreign. Anything that it does not recognize as itself can be considered an allergen. When the body encounters a foreign substance, it reacts by making antibodies. When antibodies are released into the system, they cause an inflammatory reaction we call an allergy. Allergies are extremely common, and they are on the rise. Allergens are everywhere -- in the air we breathe, in the food we eat, in the medicine and cosmetics we use, and in the plants in our backyard. Asthma, Sinusitis & Ear infection can be caused by inhaled allergens that cause narrowing of the airways and increased production of mucus in the lungs. Allergic rhinitis & hay fever are quite common in India. 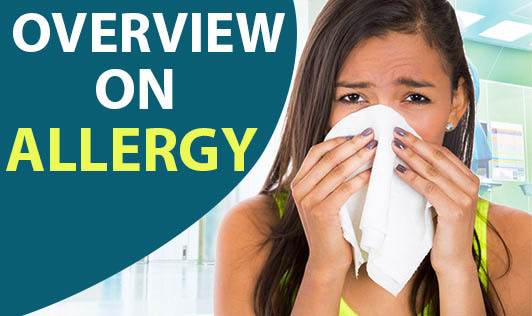 Allergy testing usually reveals the specific allergen that you are sensitive to. Treatments for allergies vary from avoiding the allergen or use of medication for desensitization or alternate therapies. People who are allergic to pollen or latex may also experience problems when eating certain foods.